Lane Electric’s mission is to provide its members with reliable service – day and night. Despite our best efforts, severe weather and unusual circumstances can wreak havoc and cause a power outage that can last for hours or days. If you are currently experiencing an outage, please visit our Power Outage Tips page. To prepare for an outage or other emergency, we have developed the below list of suggestions. Always be prepared! Being prepared is the key to keeping you safe and comfortable during a power outage or other natural event, like an earthquake. Put together an emergency kit that is easily accessible and that you don’t use for anything other than an emergency. 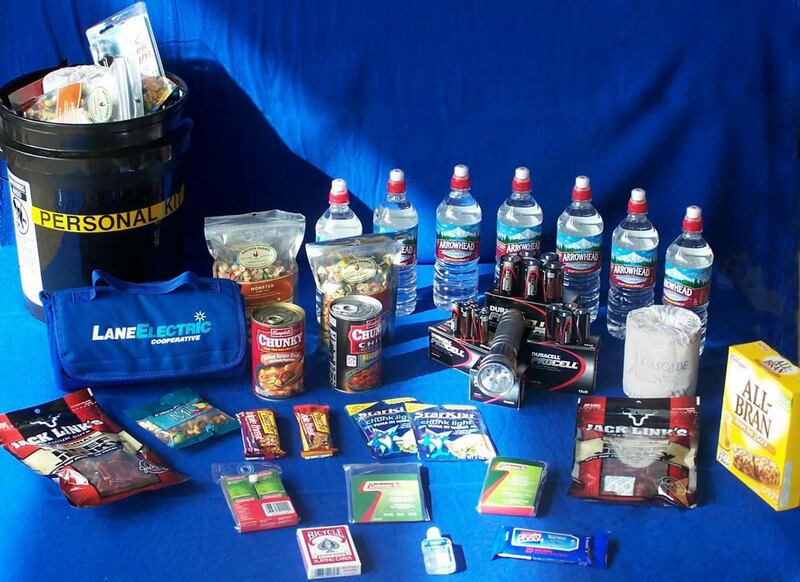 When putting your emergency kits together, plan for longer rather than shorter periods. If you plan for the worse, you’re likely to not exhaust your supplies in a shorter event. Flashlight & fresh batteries. Always keep the batteries separate until you are ready to use them. Wind-up, solar or portable radio. Bottled drinking water. Be sure to store at least one gallon per person per day. If a storm is forecast, fill the bathtub with water so bathroom facilities can still be used by pouring a bucket of water down the toilet to create a vacuum flush. You might also still have 50 gallons of fresh, usable water in your water heater. Clothing and a blanket. Wear extra layers and cover your head with a hat. A sleeping bag or blanket is suggested, too. Easy-to-prepare food items. Include items that don’t require much cooking – instant or canned soups or chili (don’t forget a can opener! ), packaged freeze-dried meals, trail mix, dried foods (fruit, jerky, tuna fish), and protein bars are good to have on hand. Ample supply of essential prescription medications and over-the-counter drugs. During a storm, road travel may not be possible for several days. First aid kit. Make sure that all of the supplies are filled and ready to go. Hand sanitizer, baby wipes and toilet paper. Cell phone or laptop computer. Games. Board games and playing cards are fun and handy to pass the time. 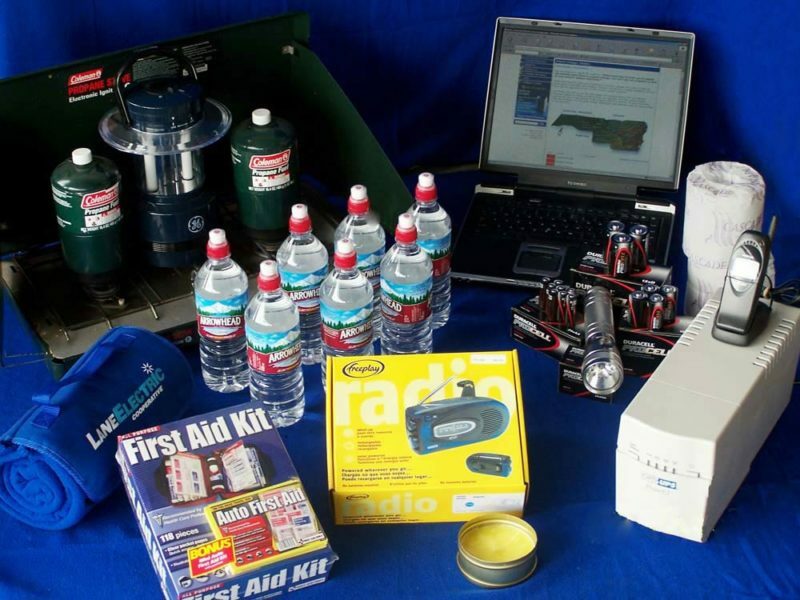 We suggest creating both a “Personal” and a “Household” emergency kit just in case a lengthy power outage or other natural event happens in your area. Your “Personal Emergency Kit” can be built in either a 5-gallon bucket or a backpack – something that you can easily pick up and take with you. You can fit quite a few supplies in these containers. All the items in the adjacent photograph fit in a 5-gallon bucket. Your “Household Emergency Kit” may require a bit more space than a 5-gallon bucket or a backpack, but it still should be something that you can easily carry and grab in a hurry. While you can pack anything you like in each kit, we have shown and listed things that we feel are essential. It is recommended that each member of the household has their own kit. Remember, during an extended outage, you need to think about basic necessities and survival-type items, not all the comforts of home. For more information on building your emergency kits, you can also go to: oregonpacific.redcross.org.